Let’s face it; you’re probably just as obsessive about your bike as we are. So when you’re debating a rear hydration solution it’s not going to be a spur of the moment decision. You’re going to do a bit of research. How many bottles do you need to carry? And do you need to carry a saddle bag (or two)? Once you narrow down your “must-haves” only then will you be able to find the rear hydration option(s) that meets your needs. As you begin your search for that perfect product, we have no doubt you’ll come across XLABs. With 12 options to choose from, XLABs offers products ranging from minimalist single-bottle carriers to a wing capable of carrying everything but the kitchen sink (built for a range of frames). To help you narrow the choices, let us walk you through five of the options XLABs has to offer. Before we examine the range of wings, we need to determine exactly what you need. For example, how much fuel are you expecting to carry on the bike? Hopefully you’ve had the chance to peruse our AeroGeeks Hydration Guide to help you determine your expected consumption. Remember you’ll need to consider more than just your race-day requirements. While there will be aid stations to supplement your fueling needs during your IM and HIM, what will you do when you’re riding solo during a 4-hour training ride? Additionally, you’ll need to determine if you’ll be using your rear carrier in conjunction with other options such as a BTA or tube-mounted solution. Next up is the flat kit. Are you planning to carry one? We have two differing views here at AG. For example, Devon comes from a road racing background where SAG support is typical. At worst case he feels he can carry a kit in his back pocket and won’t give it another thought. Mike on the other hand comes from a triathlon background where not having a flat kit can mean the difference between finishing on the podium and not finishing at all. Plus he doesn’t want to be bothered with grabbing (or risk forgetting) his kit in transition. Much like your bottle requirements, you also want to keep your training needs in perspective. If you’re planning on doing a solo century ride, do you want to be turning around after only 20 miles because you had to use your one and only spare tube? Or are you looking to carry equipment to handle multiple changes on the same ride? All of these questions should factor into your buying decision. The majority of rear hydration options will also require a cage, and while there are many choices on the market, there is only one cage we trust with our fuel—the Gorilla. At $50, it’s definitely not the cheapest option out there, but when a race can be lost with a single launched bottle (ask Mirinda Carfrae what happened when she lost her bottle at Kona), we’re willing to pay a little extra for a product we trust. 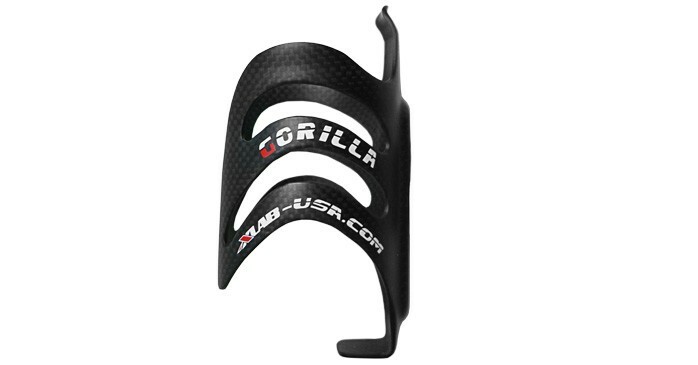 The Gorilla cage has a 7-pound grip on the bottle. And no matter the road conditions, we’ve never had a bottle launch from its grip. Even with bottles XLABs says may be problematic (such as an insulated Podium bottle) we have had zero issues. The bottom line is that every AeroGeeks frame has at least one Gorilla cage on it. That’s how confident we are in this product. The Delta is XLAB’s single-bottle solution, and is available in six varieties – the 100 and 200 for universal fitting, the 225 for Adamo saddles, the Sonix and Sonix XL (for select Cervelo , Scott, Kestrel, Fuji and BH Aero frames), and the 300 for select Cervelo frames. We tested both the Delta 200 and Delta 225 options on two of our test bikes (we skipped the 100 since it comes with a P-Cage instead of the 200’s Gorilla) and came away impressed. This is what we consider to be the race setup for those who consider any place other than first to be waste of their time. 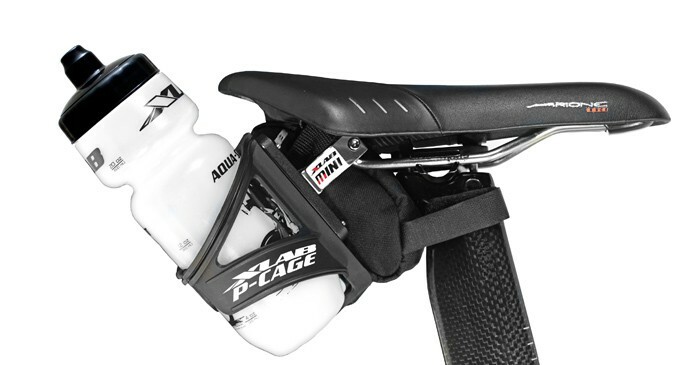 With no room for a bag you are limited to what you can stuff to the underside of your saddle (a tube and maybe some levers) and possibly some CO2 canisters via the X-Strike mount, but most that use this would choose to abandon rather than attempt a flat change. The trade-off is that you get the most aerodynamic option of our tested solutions. The Mini Wing Kit is the entry level dual bottle option from XLAB. For $49.95 (Amazon) you get two P-Cages, mounts, and a mini bag. 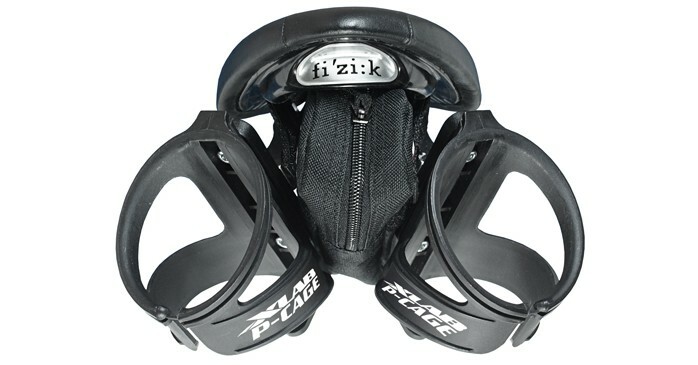 This is the only dual bottle option from XLAB that comes with cages, however as we mentioned above these are P-Cages, not the Gorillas we would recommend for your bike. 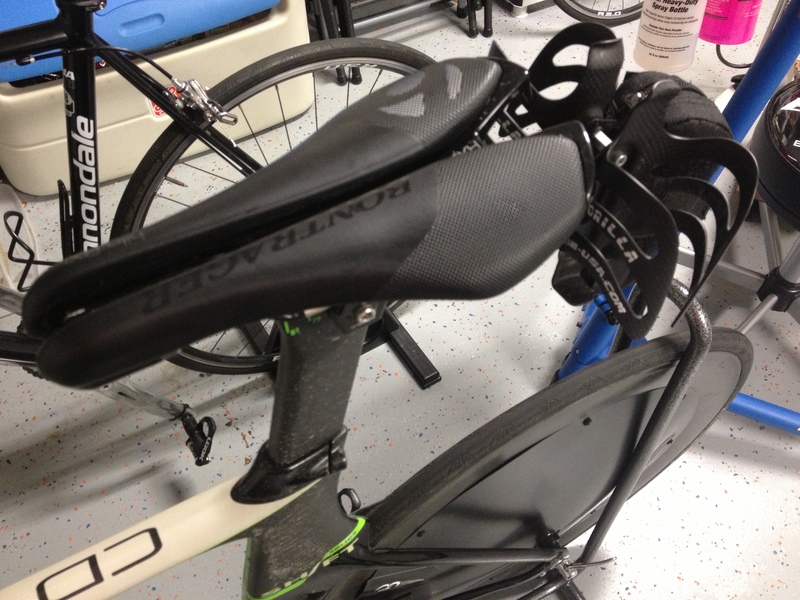 The mounts consist of two arms mounted independently to the saddle rails. We attempted to set up our Mini Wing with the arms as close together as possible to limit their aerodynamic exposure. This resulted in a complete inability to access the minibag we had placed our tubes, CO2, and levers in. So unfortunately, it is tough for us to recommend this kit unless you are not concerned with having access to your bag, and the roads you will be riding on are as smooth as glass (due to the included P-Cages). But there is one attribute of the Mini Wing that should be mentioned – weight. When compared to the other options from XLAB, the Mini Wing arms at 86g are the lightest option available, even lighter than a Carbon Wing when you factor in the mounting hardware. If you are looking for the lightest possible dual bottle option and don’t care for the ability to have a bag; try combining a Mini Wing with a set of Gorilla cages, it may not be what XLAB intended, but it might just be the setup you are looking for. The Turbo Wing is the next option available from XLAB. Instead of two independent arms, you get a single wing where you can attach two cages, a mini bag, and a Sonic Nut (thought all must be bought a-la-carte). Weighing in at 118g with hardware (but no cages), the Turbo Wing allows a bit more adjustability than the Mini Wing. You can position it at one of three heights behind the saddle (and position the cages at one of five angles. With the Turbo Wing you get the ability to carry two bottles via the cages and a tube, CO2, and levers (if you choose to add a minibag to the setup). This is the setup that will allow you to carry the equipment for a single tire change if needed (and possibly the resources for a second if you add a Sonic Nut to hold your CO2 and inflator). The Turbo Wing is a bit thinner than the Carbon and Super Wings and thus provides a slight aerodynamic advantage (at a tradeoff of carrying capacity that we will cover in a bit). 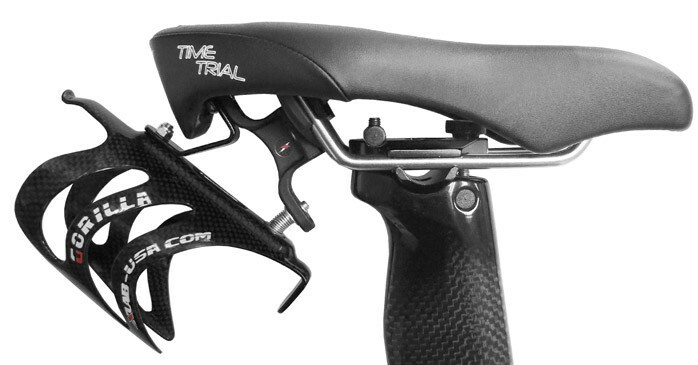 This is the setup that we believe will handle the majority of our readers’ daily riding needs. The Carbon Wing (and its heavier brother by 38g, the Super Wing) is the SUV of XLAB’s lineup. They both can carry two cages plus two bags (including the large Mega Bag with its 84 cu in. of storage that can carry two tubes, 4 CO2, an inflator and levers). If you are looking for the wing to guarantee you can handle any situation the roads throw at you, this is the wing you are looking for. This is also the ultimate training bag. Looking forward to five hours in the saddle but want to ensure you won’t need to cut it short due to multiple flats, this is the setup for you. 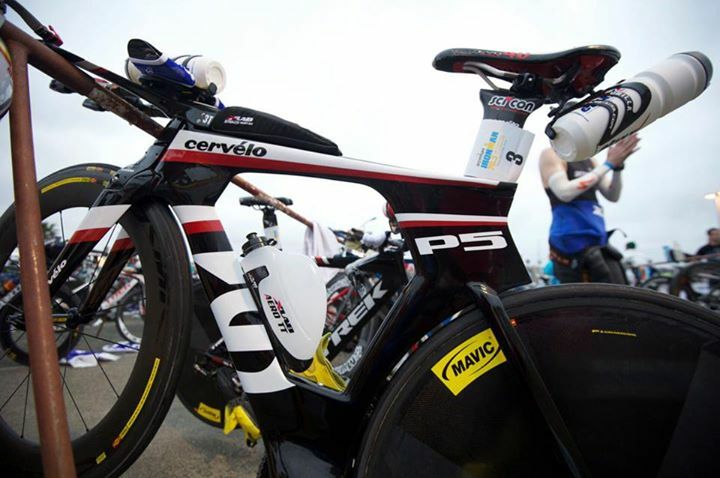 The Super\Carbon Wings allow three mounting heights and three angles for mounting your cages. As we referenced above, the tradeoff for all this carrying capacity is that the wing is wider than the Turbo Wing and thus suffers an aerodynamic penalty (which would only get worse if you mount a Mega Bag under it). If you are looking for the fastest possible option, this is not the setup for you; but it is the setup for those looking to ensure that finishing will be decided by their abilities not the cruel hands of fate. We assume you might be curious what we options we choose to ride with. Each of our editors has a primary test bike used as part of the AeroGeeks review process. On Devon’s bike you will find a Delta 225. As mentioned above, he prefers to keep his bike as aero as possible and keeps his flat kit in his jersey pocket. He also tends to need a bit less fuel than Mike and can handle training and races with a single bottle. Mike on the other hand goes through fuel like it is going out of style and tends to be a bit forgetful. He uses a Turbo Wing with a minibag to store his repair kit. While the Carbon wing would meet his needs, he prefers the slightly thinner profile of the Turbo. Hopefully this covers any questions you may have regarding the wing options of XLAB. However if not, feel free to comment below or on Facebook and Twitter and we will make sure to get them answered for you. 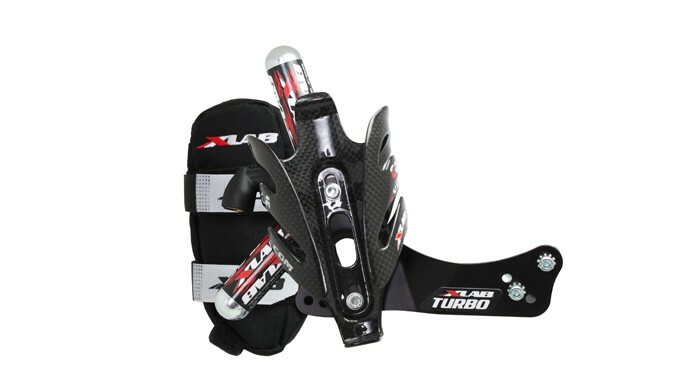 Hello, can a I use the xlab 100 in a Adamo Racing? We believe so, we have used similar mounts with Adamo saddles. However we would recommend reaching out to XLAB to be 100% sure.